Sauce Recipes – Sauce Recipe – Easy Sauce Recipes | Cook Eat Delicious! Sauces are essential in cuisine from the world over. A sauce is a liquid or semi-solid food that is used in cooking foods or served on top of. They are a complement and sometimes the star of a dish. Sauce can be used in any meal. Use a thick sauce, syrup, for pancakes in the morning. Or try a nice balsamic vinaigrette dressing sauce on a lunch salad. For dinner, eat a yummy freshly prepared pesto sauce on pasta. 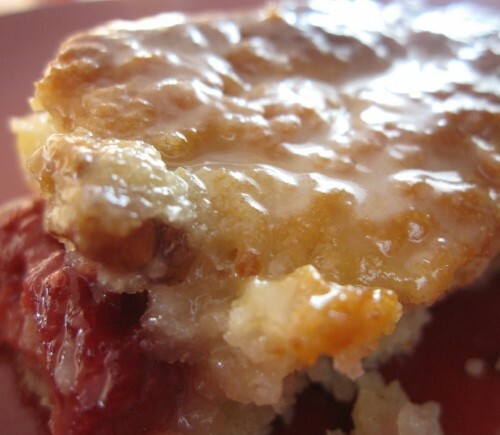 Finish the day with a warm raspberry coulis sauce to cut the rich chocolate of your slice of cake. Delicious, right? 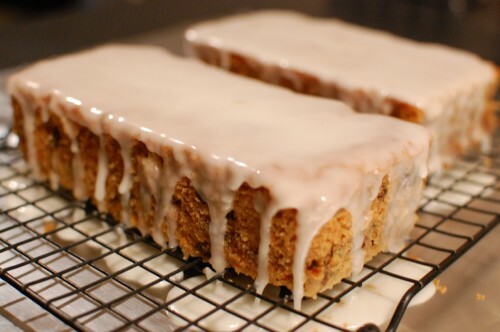 There is nothing better than a warm bread with lemon glaze. This recipe combines some great flavors: lemon, raisins, and sweetness of the carrot. It is semi-healthy…maybe, but delicious none-the-less. I usually have to make two batches of glaze because I eat the first one while waiting for the bread to cool. Delicious Rating: This is an easy recipe to make ahead for breakfast or a day’s snack. The bread stays together quite nicely and the carrots, raisins, and pecans are a nice addition. You can add walnuts if you would rather have that instead of pecans. Soak the raisins in some liquor for a little grown up flavor! Anything Glazed. Anything Lemon. Anything Cake. My Taste Buds go crazy for. After the Lemon Raspberry bread gone wrong, I decided to go small, mini Lemon Cake Buds. And when you are small, you need extra glaze! Plus, this recipe is so easy to bake up. The bad thing is that they are small, so I end up eating 12 of them not realizing I just ate 12 mini muffins with extra glaze! So be careful. Make these when you expect people to come over or bring them to a party. Do not make them for no occasion. You will eat them all in one sitting. I promise you that! Delicious Rating: These are delicious without the glaze. I kept popping the little lemon suckers into my mouth as they were cooling. 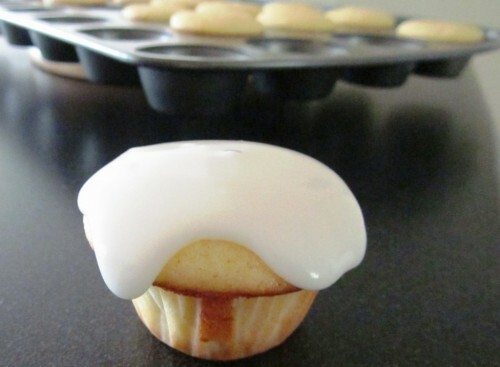 You can take the lemon cake bud and dip it into the glaze for a nice coating or just drizzle with a spoon. I will definitely be making this easy recipe again, for a nice spring afternoon! I love pasta and I love spaghetti. Correction. I love my spaghetti. Not to sound spaghetti snobbish but I am just really picky when it comes to spaghetti and types of sauce. I am not a fan of that jar stuff (although I really used to be) and I don’t like a sauce that is way too complicated and overdone with spices and ingredients. I love a simple marinara sauce on my spaghetti. This has got to be the best Spaghetti Marinara ever, truly, seriously, for reals! 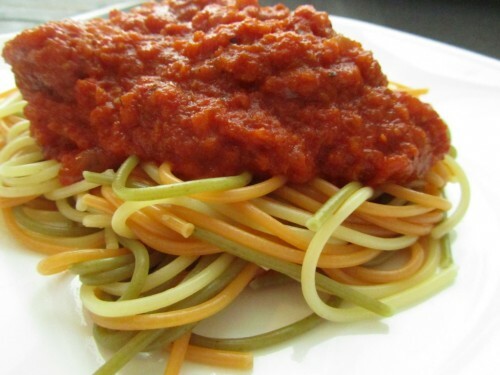 Delicious Rating: This is a super Easy Spaghetti Marinara Recipe. Absolutely Delicious. It is a vegan and vegetarian recipe, super healthy but packed full of flavor. It is a thick sauce, not runny or watery at all. Let me know your favorite Marinara Recipe so I can compare! Lemon. Raspberry. The ultimate bread couple. Add some lemon glaze and Watch Out! Deliciousness is on the way! I made this easy recipe for bread when we were going out of town for a few days. I always make some type of bread for road-trips and hotel stays. The bread stayed great wrapped and was the perfect snack throughout the day. Delicious Rating: Although the bread tasted good it fell apart to easily. Also, all the raspberries sunk to the bottom while baking. I didn’t like that the bottom was basically berries. Of course the lemon glaze was delicious. Overall, I wouldn’t make this bread again. The flavor is there but in the end I have had better lemon bread that I will make next time.